Some officials of the Ghana Revenue Authority (GRA) appear to be hobnobbing with tax defaulters, as several attempts to collect outstanding revenues had been botched. Over 200 companies are said to be owing GH¢666.4 million tax liabilities from imports. DAILY GUIDE’s sources said the Debt Management and Compliance Unit of the GRA has been hampered in exercising its functions to collect outstanding tax revenues. Several attempts by the unit to enforce regulatory directives were frustrated by some powers that be at the GRA. The Debt Management and Compliance Unit recently invited the media to accompany it on an operation to enforce tax compliance but the exercise was called off at the last-minute amidst flurry of consultations with no explanations given. Some 207 companies that are keeping their imported products in bonded warehouses are said to have defaulted in import duties and tax payments to the tune of GH¢666,401,848.23. The tax evasion took place between 2010 and 2016. According to the GRA, each defaulting company would pay a 300 per cent pecuniary penalty as punishment to forestall the recurrence of similar acts in the future. But the authorities had not been able to enforce the law. Some of the companies were cited for tax evasion in pharmaceuticals, rice and sugar imports, automobiles, building materials and general goods, among others. 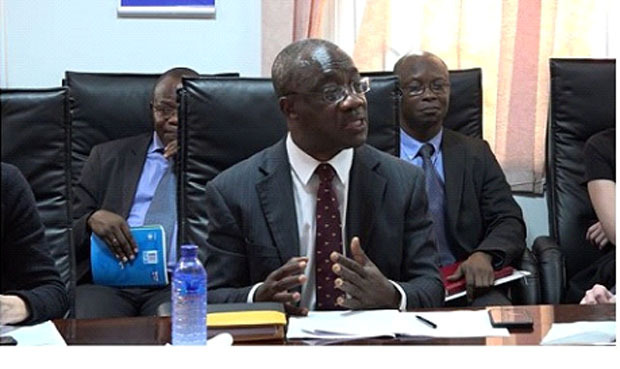 Ken Ofori-Atta, Finance Minister, who presented the mid-year budget review to Parliament recently, stated that government would intensify tax compliance and plug existing revenue leakages. Latest statistics from the Customs Division of the GRA said it missed its target by GH¢341.26 million on duties on imported goods, representing 23.6 per cent for the month of June alone. The provisional June 2018 revenue collection report of the GRA indicates that the Customs Division of the GRA, which had projected to collect GH¢1,445.40 million in duties at the country’s ports and other revenue check points, only realised GH¢1,104.14 million. The shortfalls, sources indicated, was as a result of official complicity in tracking the accurate revenue.